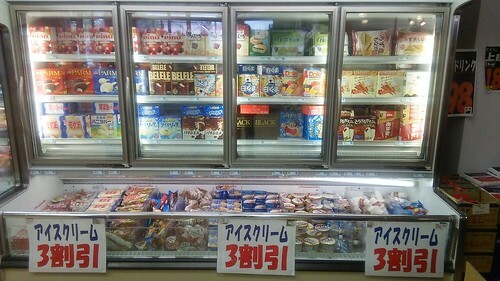 This Kawabata Ichiba (market) (map in Doujou Monzen Arcade in Yamaguchi Ciry offers ice cream at 30 percent off the recommended retail price. Note the availability of red bean and green tea flavours both in three different varieties. There are also suckable Coolish tubes of ice cream are only 130 calories for the chocolate flavour. In contrast to most Japanese foods which are enjoyed primarily with the eyes, which I prefer, one can eat a tube of Coolish ice cream without seeing the brown or white stuff at all. I think perhaps that the prevalence of suckable foods in Japan is a return to the breast kind of thing. Japan probably has the longest period of breast feeding of any nation in the world, with some mothers breast feeding till primary school. Macfarlane argued that Japanese mothers breast for the longest in Asia (Macfarlane, 1987, see Dykes, Fiona, & Hall-Moran, 2009) and compared to British women only 28% of whom breastfeed their infants at 4 months, nearly 70% of Japanese women breast feed until the end of the 4th and 60% till into the 5th month (Dykes, Fiona, & Hall-Moran, 2009, p.62). Japanese men especially I think consume suckable food products into adulthood. 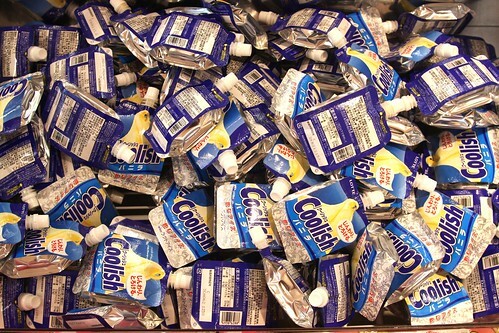 One ostensible reason for suckable food products is due to Japanese being so busy, which may be true because their is never too much to do for children so matriarchies tend to be busy. Another reason for suckable foods is due to the taboo on public food consumption, especially while standing and worse, while walking. The latter is felt to be an offence both to those required to watch you eat, and to the person who prepared the food which is not being savoured but consumed on the hoof. So in addition to being a possible breast substitute, Japanese suckable foods are also a clever way of eating quickly and surreptitiously. Dykes, F., & Hall-Moran, V. (Eds.). (2009). Infant and young child feeding. John Wiley & Sons.